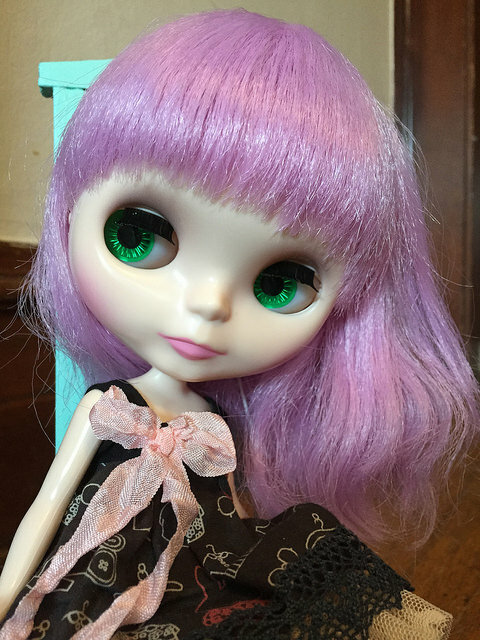 I had my eye on her since I first started googling Blythe. Something about her just said that she needed to come home to me. She was my first never-removed-from-box doll and it was such a fun, exciting experience! She's the newest release in my collection by 9 years! Her hair is really growing on me more and more each day. It was initially what scared me in the days leading up to her arrival. I saw a lot of stories of her hair being poor quality, too thin, or badly cut so I was nervous. My girl came out just fine and I was so relieved! 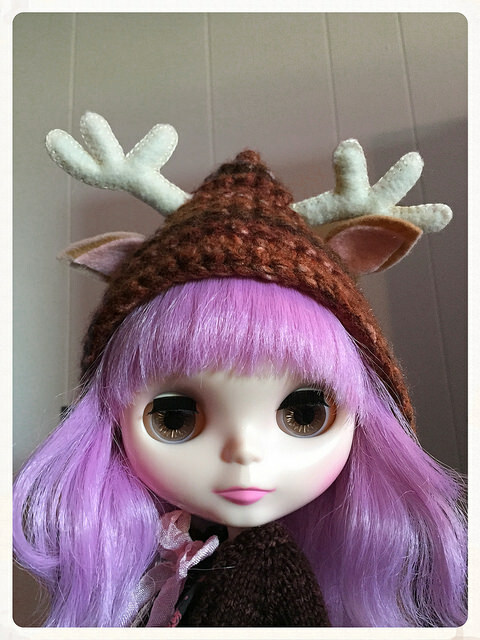 I trimmed up her bangs just a little bit but they had the layered out, rounded cut like the pictures. The texture of her hair is kinda fluffy and poodle-like which I decided to fully embrace. She's had one spa treatment just to get some of the weird kinks out from being in the box for a couple years. I think she has a really nice shade to her hair. It's not too bright that she looks off next to girls with natural hair colors. I am fully about the FBL life now. I've seen it, I've experienced it, and I cannot go back. 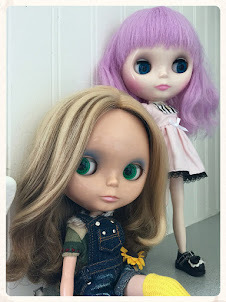 I think she has the sweetest doe-eyed look to her and there is something incredibly innocent about the FBL face. 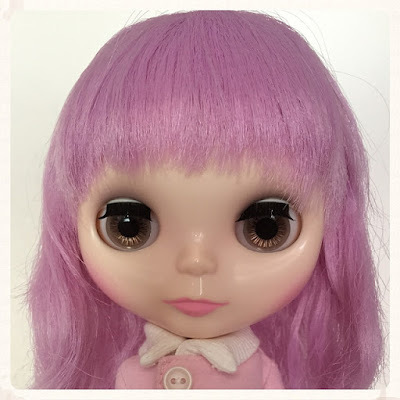 Her skin is pale and she has pink blushy cheeks and pink lips with brown eye shadow. Her special front facing brown chips are definitely my favorite on her. I may add a realistic set of lavender or light pink eyes on her to replace her stock pink eventually. Here's the biggest difference between the newer releases and the older releases, in my opinion. The amount of stock is dramatically different! I really don't have a problem with any of her clothing, there's just not a lot of it. I will use all of it on different girls just styled differently. I think she should have come with a skirt or a dress for under the jacket since no one would just wear a jacket. Right? Overall, good useful pieces that work well with mixing and matching. Fawn wants to go outside so badly! She could never do anything wrong.. not a thing. And that's where the name Fawn came from! I know fawns aren't fluffy like her hair but they're kinda wild and untamed with a touch of innocence. I like dressing her with a bit of a darker side to contrast that. She looks cute with black and white stripes, a little emo, mixed with browns and light baby pinks. She's a little introvert and the sweetest girl in the family! I cannot wait to get her outside and take pictures of her in a wooded area. I'm on vacation this week! Yes! It's a much needed break from work.. trust me! One thing I wanted to do this week was some thrifting and among other things, hopefully find some stuff for my girls. What I've been wanting are any sort of vintage porcelain animals to pose with them or just to decorate my apartment. If I could find a little deer for Fawn (my LH), I would be overjoyed. Let's begin! 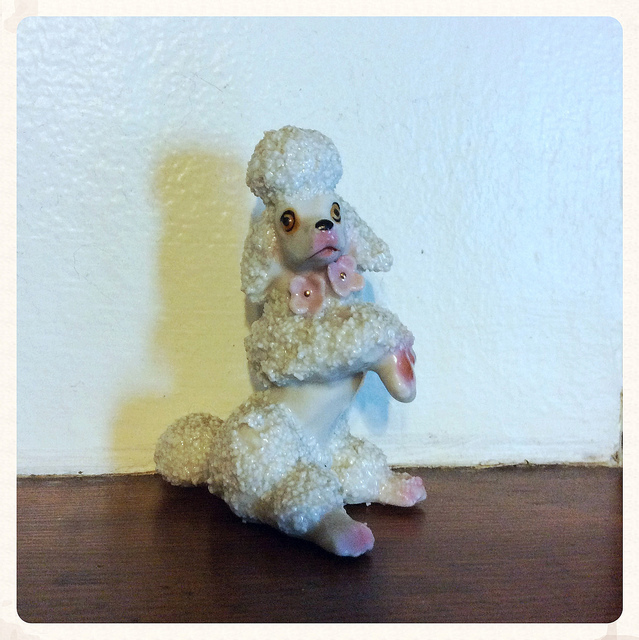 I've been collecting (very slowly) any sort 70's inspired artwork of poodles and I found another one today. The green one is the newer one and I love displaying them next to the old phone. 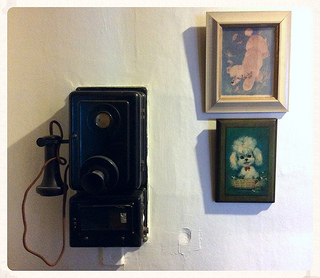 Side note: the phone actually still works and is the buzzer system with the ground floor in my century old apartment! It's really cool but you can't call mom on it, only the manager.. I found these beads in a pile of vintage beads and buttons. I'm planning on using them for Fawn's pull string eventually. Again with the poodle theme. 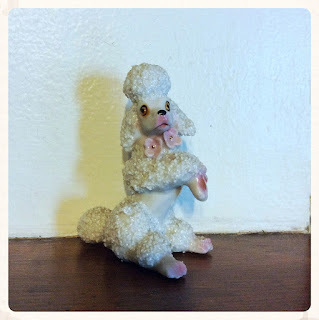 I found this really cute porcelain poodle with curly puffy hair and it turned out to be just the right size to be a pet for a special girl who will be here next month! Ok, and I saved the best for last! 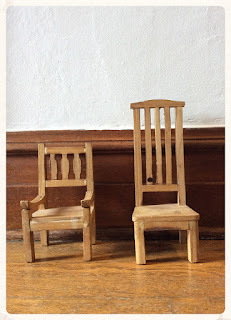 I found these two, perfectly Blythe sized chairs at one of the biggest thrift stores in my area. They were in the back of the store amidst a bunch of other furniture as if they were just another set of normal sized chairs! I'm going to paint them a minty green and distress them to look antique. I was so excited when I saw them! That's what I found this round of thrifting. It was super fun and I found some great pieces for pretty good prices. Next up: Highlights from youtube! Eunice having an out of body experience! I've been torn on changing out some bodies on a couple girls. The only real problem is that I have such a hard time customizing any of them more than just their pull strings. For me, I think I'm scared they are going to lose that something special when they are not their stock selves! I'm actually very fond of the stock Takara body. The stance of their legs and arms just has a bit of class and loveliness to it. 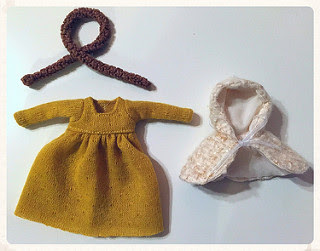 The Licca body is something I'm playing with the idea of right now. It does give the doll a bit of a younger feel and I'm curious as to what Fawn or Blair may look like in it. My only real concern is just getting the skin tone correct to match the doll. The Pure Neemo Flection body is the only one that I've tried. I bought the small size and it didn't really do it for me. 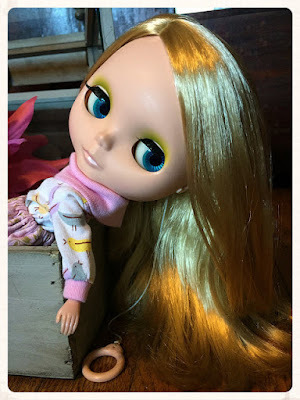 Part of what affected my perception is that the body I received had pretty weak joints and couldn't hold the doll up so all she could do was sit. Is that normal? 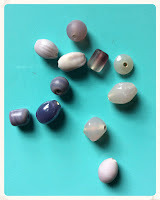 I've seen some tutorials on other BJD bodies getting restrung. I'm just not too keen on having to do that myself so I was turned off. I also think the spindly Takara legs are extremely cute and the Neemo legs were rather thick comparatively. So I have mixed feelings. I love seeing the pose-ability on other doll owners' pictures but I couldn't really achieve that with the body I purchased. I will probably by an XS size and see if I'm happier with that in the future. Blair is my I Love You It's True. I think it's a really strange name and I would love to know more about the name selection on some of the dolls! She came to me like my Disco Boogie, without her original box but with all of her stock clothing. She has a really pretty, sun-kissed blonde shade to her hair. It's super soft and didnt require a hair treatment although I might try the iron straightening technique. 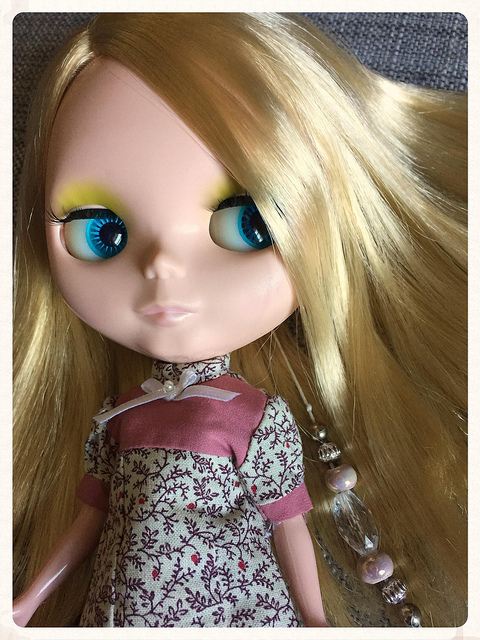 She's my first side part doll and I've definitely had to learn about tying the hair back to keep it out of her eyelashes where it loves to gather! All is not perfect, however as she has very thin hair on the top of her scalp which shows too much skin for my liking. I noticed when I first put her hair in pigtails (adorable, by the way) so she definitely cannot be photographed from above unless her hair is down. Other than that, it doesn't look thin when styled or laying down naturally. She was lightly customized by her previous owner. Spray matted with MSC, new eye lashes (which are really pretty), and I suspect at least one set of eye chips changed from what I can tell by looking at pictures of other ILYITs. She has yellow eye shadow and baby pink lips which you can barely tell until the light hits her just right. She is a simple beauty without a lot of makeup and I think when she is styled right she can look extremely sweet. Her eye chips are the sky blue (pictured), green, pink, and a light champagne color (below) which is my favorite on her. So, I'm really not too fond of any of her stock. It's just a personal style thing, not a quality problem. It has a lot of cute pink and blue florals but the outfits just seem kind of dated at this point. Again, with the older dolls, there is a lot of stock here compared to newer releases and you just can't be mad at that! She also has a small emblem on a few of the pieces that resembles tiny butterfly wings. 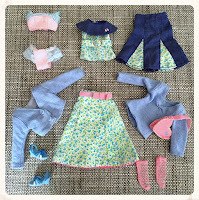 Her baby blue tshirt and cardigan are pretty versatile and have been used before as layering pieces. 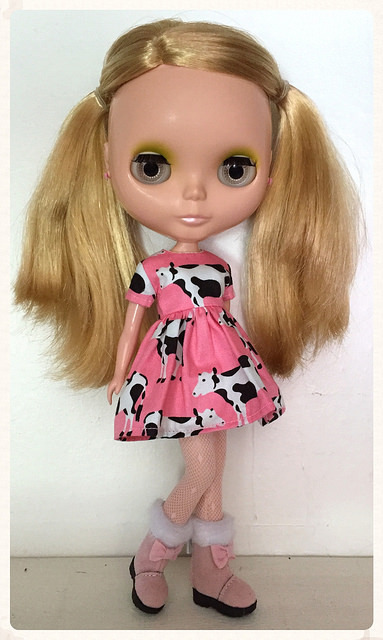 She also comes with another collared floral top, two skirts, pink mesh socks, sandals, pink bow earrings, and a pink heart shaped purse. Oh yeah, I almost forgot about her best part. Her undies. Very. Cute. And for her name.. she's actually named Blair after the character in The Facts of Life! She kind of struck me as a kindred spirit to the tv character and I just couldn't get the name out of my head after that.. and so it stuck. 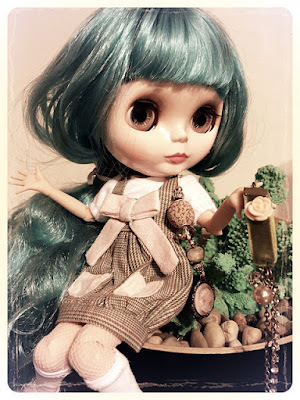 And I hope, but cannot promise, that she is the last Blythe that's name is inspired by an 80's sitcom character. I dress her in a lot of pink and girly styles with graphic prints. She loves toys and has a couple she packs around with her everywhere she goes. I really want to get her a cute handmade teddy bear from Etsy someday. Today I have a doll haul! 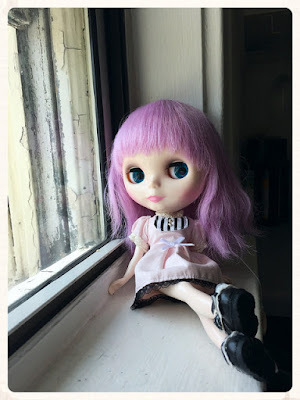 A couple weeks ago I purchased a Blythe that I had been keeping my eye on for a while. As per usual, I also ordered her an outfit about the same time.. and I ended up ordering an outfit for everyone and a few extras! I just couldn't help myself! 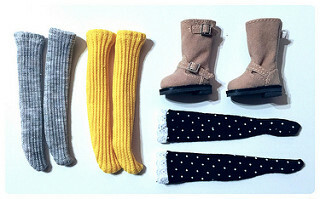 Boots and socks from hellocoolcat! Black bow and pink boots from bsskid. Heels from dollbonbon. 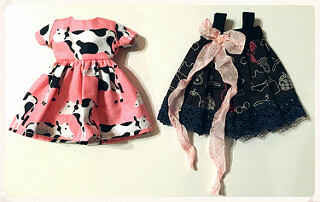 Cow dress from minijijo. Play dress from pinkedhood. 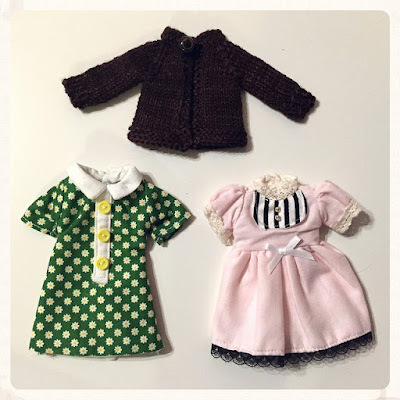 Dresses from polarfluff. Sweater from tiredmomknits. blablablythe is one of my favorite shops. Very unique and stylized items. And finally, I got a special package in the mail! I've had my eye on her for a long time! She's a Lavender Hug and my first FBL! I'm in love with her. She has the sweetest face and her brown and blue eye chips are so pretty. Next up: My review of my I Love You It's True. Good God, that Grail Girl!